An interdisciplinary conference featuring presentations by Banu Cennetoglu / Visual Art, Didier Faustino / Architecture, Zak Kyes / Graphic Design, Okkyung Lee / Music, Kazuo Okanoya / Neuroscience, David Peace / Literature and Yeoh Lam Keong / Economics. BRIDGE THE GAP? aims to create an ongoing forum for artists, scientists, designers, and thinkers in the humanities to exchange ideas and stimulate each other in an interdisciplinary exploration while respecting the different approaches and values in each discipline. Instead of certitudes, BTG? expresses connective possibilities. This nomadic format of CCA Kitakyushu included artist Marina Abramovic, architects William Lim and Rem Koolhaas, quantum physicist Anton Zeilinger, and sociologist Saskia Sassen, in previous editions of BTG? 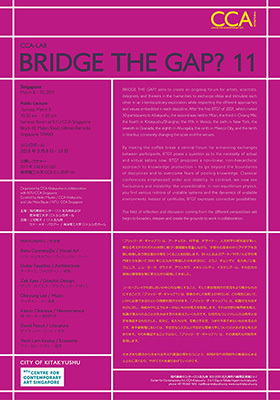 Curated by Akiko Miyake, Founder/Programme Director, CCA Kitakyushu and Ute Meta Bauer, Founding Director, NTU CCA Singapore.